We have Hurricane Sandy to thank for the snow day off from school. For those of us here in northern Ohio the worst of the storm brought rain, snow and slush. Several people further north of us had some flooding and some power outages. Nothing like the magnitude of the flooding and loss of power and life for those poor people on the east coast. Although I am glad for the beautiful snowy morning and the ability to stay home in my cosy house I feel so bad for those people back east. Our alpaca girls didn't quite know what to make of the snow. It was such a wet snow that it was dripping off the roof over the doorway of their small barn. To them it must have seemed like it was raining so they stayed inside munching the hay all day instead of going out into the pasture. When I visited them they were standing in the open doorway gazing outside with longing for the grass. It is clear that although they will eat the hay they much prefer the fresh grass in the pasture. when I wear it, that I made it from one of their relatives! Today I knitted on a scarf made from some lovely brown llama yarn that I spun myself. This is the second product that I have made from my own hand spun yarn. I am clearly a novice spinner but it is a learning process. I have my colleague, Scott, to thank for the beautiful llama fleece. I sent it out for processing into roving for me to spin on my Ashford Traveller wheel that I named Bridget. The llama is a pleasure to work with. Thanks, Mr. G.
Yesterday I was discussing why I own alpacas with a girl in one of my seventh grade classes. 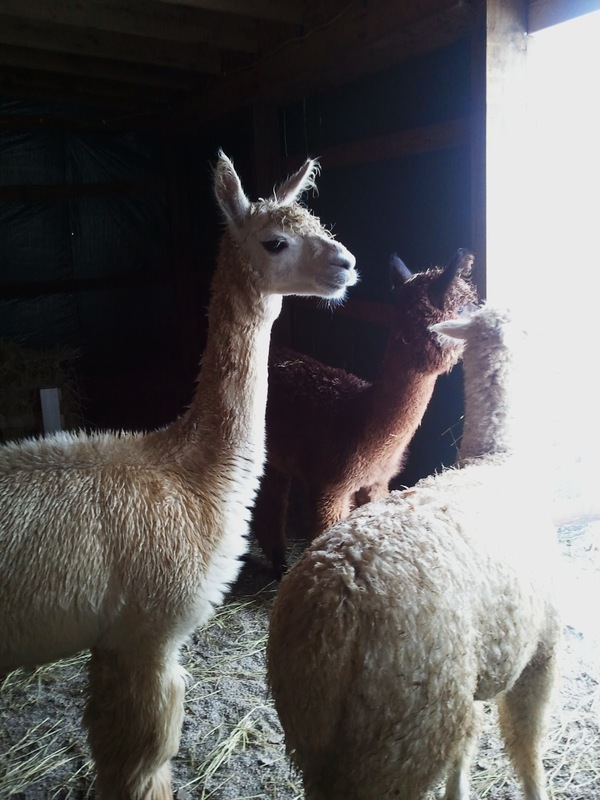 I explained that I am a knitter and a spinner so the alpacas created an endless supply of fleece for me to work with. The young lady gasped in horror and her eyes grew very wide. I quickly explained to the city girl that you don't kill the animals for the fleece, your shear them! That is what those of us in the teaching profession call a "teacheable moment!" Early this morning I went out to the barn to give our alpaca girls their supplemental feed. They don't eat much of it because the pasture is still lush with grass and that is apparently as good to them as ice cream is to me. It was misty, windy and bitter cold out there this morning and I was wishing that I had worn a heavier jacket. When the girls heard me open the barn door they stood at attention like they do whenever something new appears on the scene. By the time I had filled the bucket with food and entered their boudoir Took had started toward the barn. I dumped the feed in three of the four feeding troughs and tapped the bucket to get their attention. Took and Mango came closer to the door but seemed reluctant to come all the way inside as long as I was there. I stepped back through the gate and latched it firmly but leaned on the top of the gate watching. All the while, I was talking softly and humming to them encouraging the girls to come on in to breakfast. Took was the first to come in. She began eating at the trough farthest from me. Mango followed her mama and instead of eating came up to me at the gate and started sniffing and nibbling my sleeve. Leeza, still more reluctant to voluntarily come close to us, edged into the feeding area on the far side of Took. The far bin is the one I left empty. Leeza nosed around in the empty bin and made a whining noise, clearly because she wanted in on the action. She attempted to feed in the bin occupied by Took who nosed her out of the way gently. Took eventually moved to the center bin closer to me at the gate and Leeza took over eating whatever Took had left in the first bin. Mango eventually left me and nibbled a bit of feed in the bin closest to the gate. After they had eaten they glanced at me with a bored look and meandered back outside to the pasture. They are becoming more used to me and do not get so nervous when I am around. I wish I had taken the camera with me. My only excuse is that it was very early and very cold. I didn't linger long. A long time ago I discovered that when I get home from school and I am all stressed out it helps me to brew a cup of tea and just sit for a few minutes enjoying the quiet. Lately I have changed that routine a bit and I take that cup of tea out to a seat beside the pasture and just talk to the "girls" as I sip. They look up with their usual curiosity and hum at me as I take my seat and settle in. I just talk quietly to them, telling them about my day and asking about theirs. As I talk and hum at them they casually mosey over towards me getting a bit closer every day. Gradually I begin to feel myself calm down and the stress leaves my neck and shoulders. My breathing quiets and deepens. Eventually, I stop talking and just listen to the gentle humming of Took, Mango and Leeza. It seems that they are slowly getting used to me and their new home. Tonight Took nervously screeched three or four times when the dog came out and then settled in to her grazing. Callie dog even ignored them in favor of sniffing for critters in the recently harvested cornfield. We are making progress toward the harmony I had hoped for when we adopted alpacas. Ahhh! Peace. Baby Mango is the most daring. She comes nearer than the other two. We just returned from our annual family reunion weekend at Lake Hope in the Hocking Hills. We had a wonderful time with the siblings, kids, grandkids and in-laws. The autumnal color was at its height and though it did rain off and on we had mostly clear weather. Saturday night Rich cooked his famous pork roast over the open fire and it was a hit as usual. This year he added colonial corn spoon cooked in an iron kettle over the open fire. It was crusty golden brown on the outside and creamy and pudding-y on the inside. That dish was a hit and will appear on next year's menu. There was about 10 minutes of rain at the beginning of our dinner and a few "chickens" rushed inside one of the cabins. Those of us who stayed outside were treated to the sight of a beautiful, neon, double rainbow. Saturday night was also the annual trick-or-treating and pumkin carving contest for the kids and the rain stopped long enough for that. Even the teens and pre-teens participated this year. Their outfits were probably the most creative and colorful. "Katy Perry" even put in an appearance! Callie was really glad to see us. She always is and it makes Rich and I feel very appreciated even though we know she just wants to come back inside to her cushy bed and breakfast! We do spoil her. Once I unpacked and started the laundry I went out to the pasture to visit the girls and give Callie another lesson in proper alpaca etiquette. She is getting much better at sitting patiently beside me while I stand at the fence and talk to the other "girls." The fact that I have a pocket full of her favorite treats helps! Took, Mango and Leeza stay at a distance and keep their backs turned to me when Callie is beside me. It is going to take some time and patience on my part to get the animals accustomed to each other. I don't fool myself that they will ever be friends! We left the aplaca and dog girls in the care of my wonderful, patient, brother-in-law, Danny, who lives down the road. He's an animal lover and has always cared for our dogs when we are away. We returned to find happy healthy animals as we always do when Dan is in charge. We are very fortunate to have relatives like Danny. The Alpaca girls ignoring Callie and I.
Mango, Leeza and Took. Still awaiting the arrival of Magic's Black Firenze. I went out to visit the girls in the pasture last evening, shortly after sundown. I stayed outside the pasture and stood close to where they were grazing. Of course they were curious and looked my way and then Mama Took and Leeza returned to grazing. Our little cria, Mango, is a bit of a rebel already and in spite of her mama's cautious humming, she walked over to me, stopping just a couple of feet away to look me over. I hummed. She hummed. Then she returned to mama's side and continued to graze. At this point Leeza, our yearling, decided that she wanted to play a bit and strolled over to Mango. She bumped gently into Mango's side and then turned sharply and pronked away a couple of times. Leeza stopped and turned to see if Mango would join her. She pronked a couple of more times and then finally gave up and returned to grazing. For those of you who have never seen pronking (hopping forward and upward with all four feet off the ground at once) it is a fascinating sight to see a couple of young crias at play, running and pronking through the pasture. Our Lab, Callie, is becoming more comfortable with the girls. She still needs watching though or she will run madly around the pasture from one side of the pasture to the other. The alpaca girls are curious about Callie but don't really appreciate her frantic running around. They don't mind her when Rich and I make her stand beside us and stay. Then they will come closer to investigate. We are confident that eventually they will all learn to live in harmony...or at least tolerate each other. I so enjoy just sitting in a chair out by the pasture watching and talking to our three "girls." They take an occasional break from grazing to look up at me curiously, give a quick hum and then return to their eating. They are eating machines, grazing in one corner of the pasture and then moving along to another spot to sample the grass in a new spot. And, of course, it follows that since they are eating continually, they are also dropping "alpaca beans" everywhere. I shoveled a wheelbarrow full on Saturday afternoon and boy the wind was cold. Imagine what it will be like this winter. It's good that I prefer cold to hot weather. Then on Sunday evening, Rich shoveled another cart full! Does anybody out there need fertilizer for their garden? If you had asked this city girl twenty years ago whether I could have imagined myself living in the middle of a cornfield I would have said, "No way!" But almost twelve years ago I married a country boy and as of a week ago we officially became alpaca farmers. Last Saturday we celebrated the arrival of three lovely female huacaya alpacas and are awaiting the arrival of a fourth, a lovely black female named Firenze. Took, a beautiful white six year old and her four-month-old female cria, Mango seem to be settling in and enjoying our small but lush pasture. Leeza, a beautiful dark brown yearling, is their herd mate and she is adjusting very well. Our five-year-old Labrador Retriever, Callie, is having a little bit of difficulty understanding that these new "girls" are here to stay and pose no threat to her status as the princess of the acres. We are confident that she will adjust. It takes time. My husband, Rich, and I became interested in alpacas last April when we stayed at Historic Maple Hill Manor B&B in Springfield, Kentucky. We became fascinated with their herd and considered the possibility of starting a herd of our own someday. That began seven months of research about alpacas and owning an alpaca business. We read on-line articles, books, magazines and visited many alpaca farms both large and small. On one of our farm visits we found a mentor in Amy, at Amy J's Homestead not far from our home, where we ultimately purchased our first four girls. Took and Firenze are both pregnant and next summer will be delivering two more crias to add to the herd. I have always felt that life is an adventure and look forward to each day as a gift that can be filled with wonder. As an educator, I have always been eager to learn something new every day. So this new endeavor is a wonderful adventure in which Rich and I will be learning something new every day that will enrich our lives.